I might be slightly obsessed with the ‘Northerns’ of Alberta. Owl’s love of dense brush/trees and tendency to be more active at night make them difficult to spot in general. Throw the small size of these pint-size Northerns to the mix, and you’ve got yourself quite a challenge. So, when I get the opportunity to observe and photograph a small owl, I am one happy camper. Not to mention they are so ridiculously adorable! The Northern Pymgy owl is never far from my mind of late. This is mainly because, while I’ve seen one on three occasions, a great set of images have eluded me so far. My best encounter with the smallest of Alberta’s Owls (just slightly bigger than a chickadee) happened on December 7, 2013. I was out with Turbo on a frosty Saturday, -40 at times with the wind-chill, and we were having a fantastic day. It was my first experience with the wild horses north of Water Valley, and we saw over 50 in one day! This was a record number for Turbo and a great first experience for me. It was getting close to sunset and we made a last minute decision to do a final pass through what we call the NPO spot. This is an area where the Pygmy Owl had been reported on a few occasions since June 2013. We were no strangers to this spot. We had done several passes of the area on past trips with no luck. I think we had even done one that very morning. 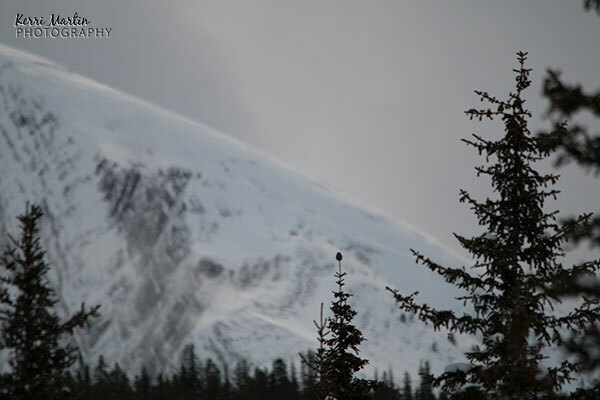 The Northern Pymgy Owl decided to cooperate that evening, and was perched on the tip of a spruce tree on the side of the road. When we stopped, it swooped down into the trees on the opposite side of the road. We pulled over and scanned the trees and Turbo spotted the tiny owl sitting on a branch. For about 10 minutes, we got to observe and photograph the little owl as it flew from branch to branch, likely scanning the trees for his next small bird meal. The owl even gave me a chance to grab my spare camera with a borrowed 70 – 200 2.8 lens that I brought along to try out (thank god!). What an experience! 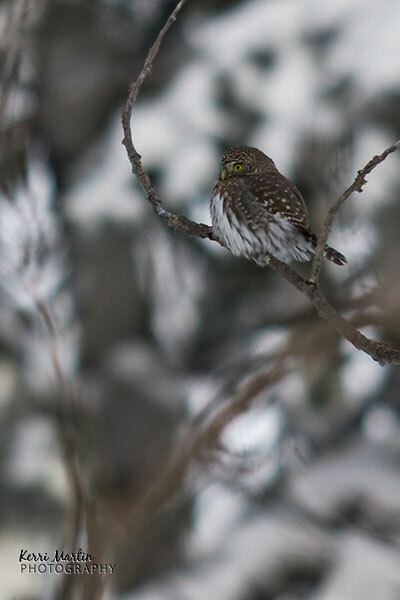 A Northern Pygmy Owl on the tip of a spruce is easy-ish to spot, if you know what to look for. But once it is in the trees, it’s pretty well hidden. I was so happy Turbo found him in the trees and we had the chance to watch the little owl flutter among the branches. Unfortunately, I later discovered the card in my camera became corrupt and I lost about 200 pictures of the Northern Pymgy Owl and 700 of the horses and our other sights from the day. I was heart broken, and actually still am to be honest. But I do have a couple of images from my spare camera, and I can’t let the fact that I lost the images negate the entire experience. It was so cool to watch this little predator. Plus, Turbo has some great pics and an account of our day here. 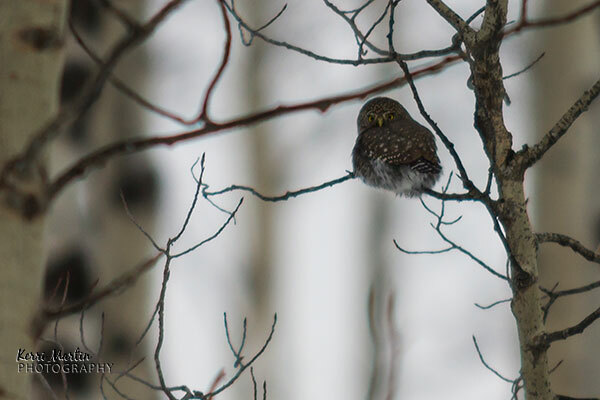 Can you see the Northern Pygmy Owl in this photo? The only other Pygmy I had seen at that point was in November 2013 and was a long way off. Somehow, I managed to catch a glimpse of a figure on the tip of a tree while out with Turbo again. I asked him to stop and turn around he happily obliged. We scoped out the little figure and climbed up a bank to get a bit closer. The images I caught are not great, but enough to get a positive ID. The image on the left, zoomed in to 500mm, is obviously not a detailed view of a Pygmy Owl, but gives a good indication of the distinct form on the tip of a tree. Can you see it? Even when it’s a long way off, that figure seems to stand out – or at least it did to me. On a recent trip to Banff, I spotted another Northern Pygmy in the same fashion. I saw the distinct figure on a branch, but the images I captured of that one are not worth sharing. Again, enough for a positive ID but that is about it. An interesting characteristic of a Northern Pygmy Owl is their eyes on the back of their heads. These false eyes create the illusion of eyes to help protect from attacks from smaller birds. They are such fascinating little creatures! 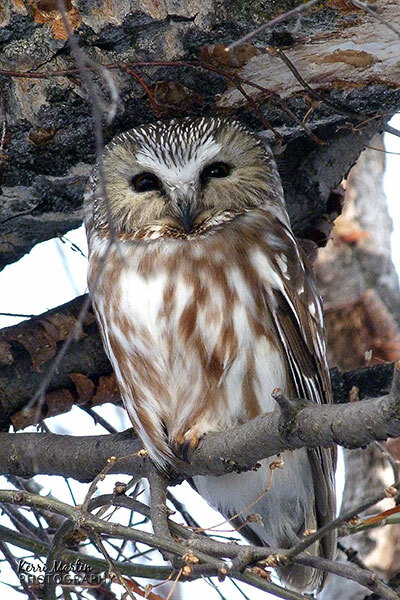 The Northern Saw-whet owl is even harder to find, at least in my opinion and experience. The Pygmy occasionally sits out in the open and they will also hunt/fed during the day. Saw-whets are usually tucked into the branches close to the trunk and are only active at night. I had the pleasure of seeing one in Carburn Park in January 2012. This little cutie was becoming quite famous, and the only reason I got to see it is it was surrounded by about 10 birders when I happened upon the location. The Northern Saw-whet is a bit bigger than the Pygmy, about the size of a Robin. I haven’t had the best of luck with the Pygmy or Saw-whet yet, but a recent encounter with another of Alberta’s small owls – the Northern Hawk Owl – almost makes up for that. A couple of Hawk Owls have been seen near Black Diamond since December 2013, and I am happy I got a chance to see them on a few occasions. They are probably the easiest of ‘the Northerns’ to spot, being bigger (about the size of a Merlin) and favoring the tips of trees. The Hawk owl likes to be high up to hunt – it has impeccable vision and can see its prey up to 800 meters away. On a recent drive, I took a side road home to avoid the busy traffic on the main highway. I was still watching for wildlife, but not really expecting to see anything because my day was almost over. I almost missed the little Northern Hawk Owl perched on a wire right beside a telephone pole. I pulled over and watched the owl for about 90 minutes. The light was amazing, with the sun behind me and a clear blue sky. The Owl dove for food a couple of times, giving me a chance to capture some flight shots as well as some ‘owl on the ground shots’ (gotta love those ;). Like many owls, the Northern Hawk Owl is fairly tolerant of people, making them great photography subjects if you can find them in the right light. Hunting during the day, of course, makes the Northern Hawk Owl easier to find as well. 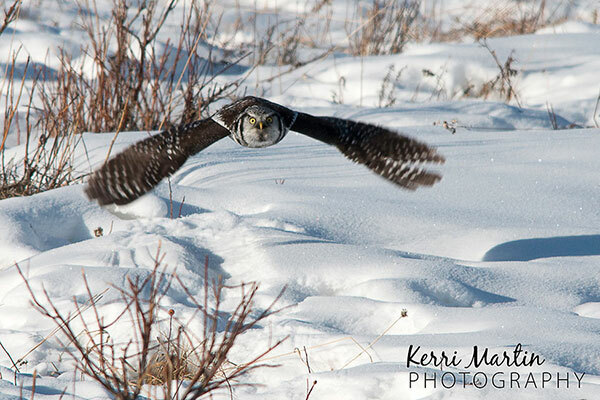 See more images of my encounter with the Northern Hawk Owl here. Great writeup and pictures, Kerri. I love these little Owls also, and enjoy taking their picture when they are willing. Good luck in finding some Burrowing Owls, you may only have about 5 years max. before they won’t be coming back here! I also haven’t seen a Boreal, but I have heard many of them when they are calling in the spring. there are actually 2 Screech Owls in Alberta! The Eastern does have a fairly well known area of occurrence, the Western does occur but in a more restricted and very hard to get at area of the province! Thanks Reid – I didn’t know we had Western Screech owls here too!